Finally, the solution to import your transactions. 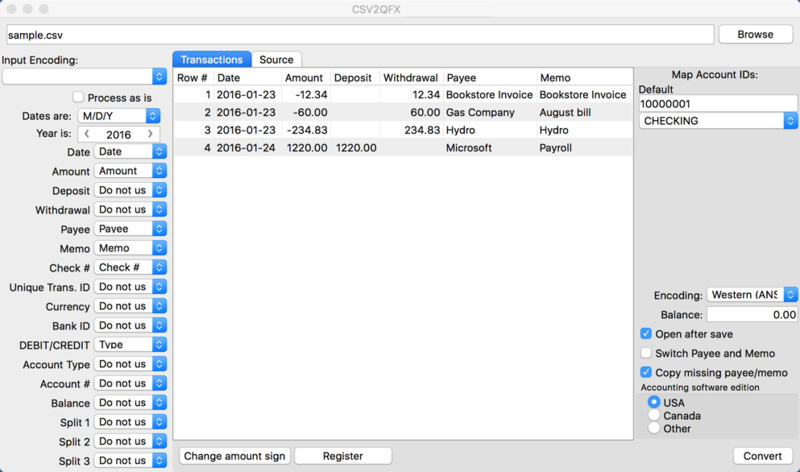 Convert CSV to QFX and import into Quicken, (PC/Mac). Work directly in Excel and copy data into the converter and convert. Created QFX files are regular Web Connect files for Quicken. Review transactions in a readable view before converting. Free trial (up to 10 transactions per file converted) is available. Support is available before and after purchase. Time and billing for professional services companies: accountants, architects and engineers. Support multiple currencies, multiple invoice formats, and dozens of rates. Connects your employee's time and expenses to invoices, payroll and accounting. Easy Time Clock Driver is our middleware software that is designed to maintain connection and communication between Easy Time Control database and your time clock of any type.